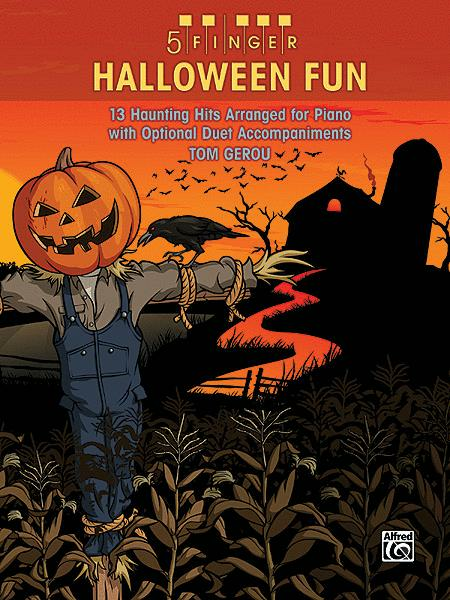 13 Haunting Hits Arranged for Piano with Optional Duet Accompaniments. Arranged by Tom Gerou. This edition: Five Finger Piano. Piano Collection; Piano Supplemental. 5 Finger. Children; Fall; Halloween. Book. 40 pages. Alfred Music #00-36283. Published by Alfred Music (AP.36283). 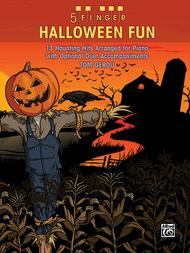 These haunting Halloween hits have been arranged in traditional five-finger style, with the melody split between the hands and without key signatures in the student part. Dotted quarter notes, triplets and sixteenth notes have been avoided. All of the melodic arrangements have optional duet accompaniments created to achieve a fuller, richer musical experience. Includes lyrics. Titles: Ding-Dong! The Witch Is Dead (The Wizard of Oz) * Funeral March * Funeral March of a Marionette * Ghostbusters * Gollum's Song (The Lord of the Rings: The Two Towers) * Grim Grinning Ghosts (The Haunted Mansion at Disneyland Park and Magic Kingdom Park) * Hedwig's Theme (Harry Potter and the Sorcerer's Stone) * Jeepers Creepers * Monster Mash * Remains of the Day (Corpse Bride) * The Sorcerer's Apprentice * This Is Halloween (The Nightmare Before Christmas) * Voldemort (Harry Potter and the Sorcerer's Stone). Ghostbusters Composed by Ray Parker Jr.
than I wanted and really didn't sound like much without adding the duet part in. Maybe more advanced students would appreciate it.